Organizes for the nine time the International Conference, “Textile Science and Economy 2018” (TNP2018) from November 06 2018. The Conference will be held at the Technical Faculty “Mihajlo Pupin” in Zrenjanin. Special attention of our conference is focused on researches that encourage enterprise development. Other topics relevant to textile science and economy. The original scientific and expert papers will be accepted for the Conference. All papers are subject to scientific review. The languages of the Meeting are: Serbian, English and Russian. Accepted papers will be published in the Proceedings of the English Language. Get directions for writing the papers here. – Submission of full papers: October 15th 2018. – Information on full papers acceptance: October 20th 2018. – The Conference will take place on November 06th 2018. All papers will be published in full in the Proceedings of the Conference. 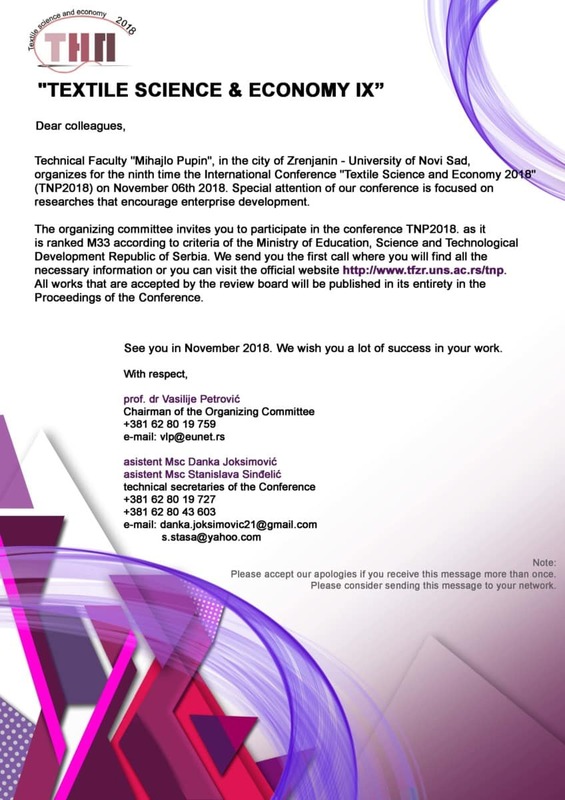 The conference is ranked M33 according to the criteria of the Ministry of Education, Science and Technological Development of the Republic of Serbia. The amount of the registration fee is 15,000 dinars or 200 euros for participants from abroad.